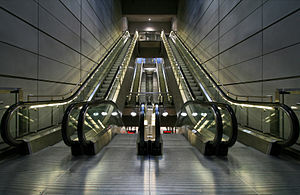 Amagerbro station is a Metro station in Copenhagen in Denmark, established in 2002. The station is operated by the Metro service M2 and Movias bus services 77, 78, 2A, 5A, 350S, 871, 872 and 81N. This page was last changed on 6 June 2018, at 05:18.